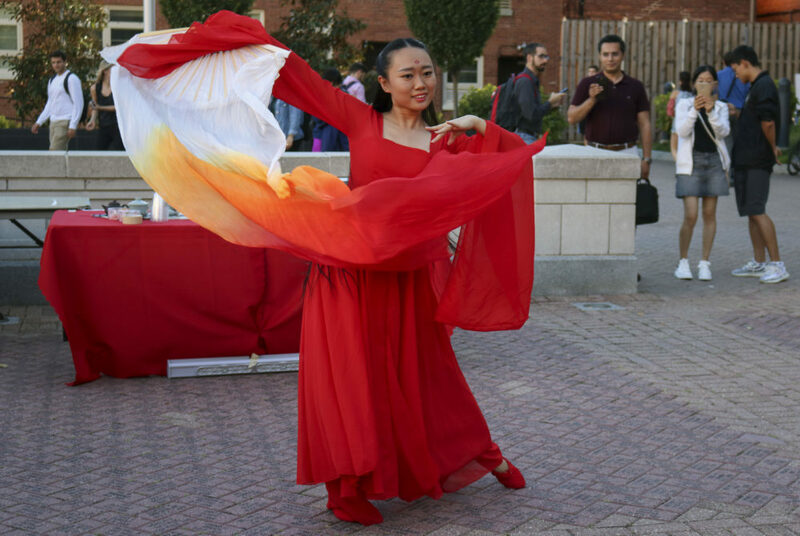 Sophomore Shiqi Dong performs a traditional Chinese dance in Kogan Plaza Thursday. 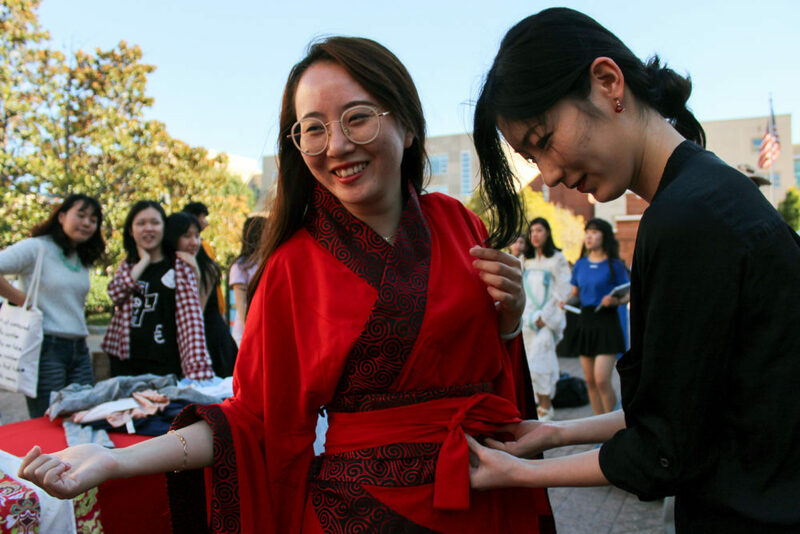 Students gathered for calligraphy and traditional dancing in Kogan Plaza Thursday as the Chinese Students and Scholars Association held the first annual Chinese Culture festival. Attendees snacked on dumplings and fortune cookies and stopped at stations showcasing Chinese music, fashion and dance. Jing Xie, the head of the group’s arts department, said she organized the event with the International Services Office, which paid the event’s venue fees and provided food. Xie said she hoped the event helped to increase the organization’s popularity on campus and the general understanding of Chinese culture. At several tables set up in front of Kogan Plaza’s clock tower, students learned how to write their name in Chinese characters. At another table, students tried on traditional Chinese clothing – ranging from the Han to Ming dynasties – and took pictures in it. At one table, students tried on traditional Chinese clothing – ranging from the Han to Ming dynasties – and took pictures in it. Sophomore Yalun Tao tired on the clothing at the event. The event also featured an origami-making station and a “chopsticks master” game, where students transferred marbles between two bowls with chopsticks. Students who transferred 10 marbles in under a minute won panda magnets. At the end of the event, student performers played traditional Chinese instruments, like the pipa – a large, guitar-like instrument – and the guqin, a long string instrument. “We are already in America and we have more chances to get in touch with other cultures like China, and there are many students here from China to study at GW,” Lu said. Jake Iannacone, a freshman attendee, said he “perfected his chopstick use” at the event but also gained an appreciation for Chinese culture and writing. “It’s the same feelings that we all share of community – eating, beauty and despite how we have different perceptions of it, it’s the same human feelings that we experience,” he said.